The Sun Day fiberglass pool is a feature packed free form shaped pool from Thursday Pools. Special features on this pool include a built in tanning ledge/sun shelf area by the shallow end stairs, a smaller sun shelf/tanning ledge area in the deep end that also serves as a swim-out, and a large open swim area which is perfect for exercise or pool games. The Sun Day is available in three different sizes so it will fit in many different spaces. 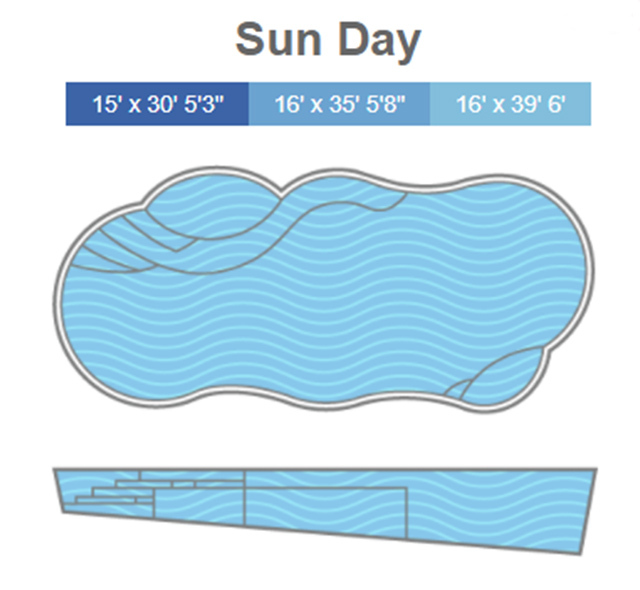 The largest Sun Day model pool is 39′ 6″ x 16′, the mid-size model is 34.5′ x 16′, and the smallest Sun Day pool is 30′ x 15′. If you love the freeform shape of the Sun Day pool, but would like a larger tanning ledge/sun shelf area we’d recommend looking at the Wellspring pool. The Sun Day fiberglass pool is installed in Illinois by Signature Pools.